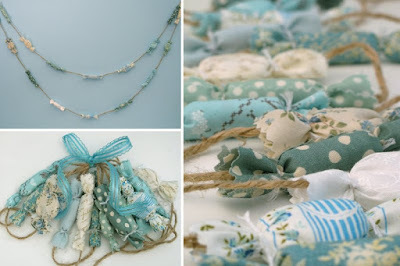 I had a vision of an aqua & white Christmas. The kind that looks frosty even though there is no snow on the ground. During many failed searches for aqua ornaments, I noticed that all the stores are stocked full of peppermint red & white stripes! Where were these last year for my peppermint-themed Christmas?! Well... I could not find aqua anywhere. 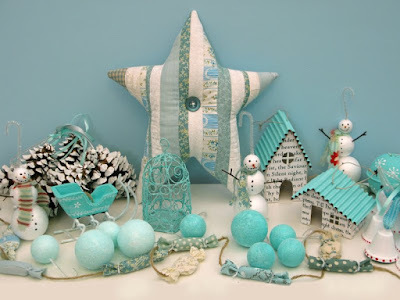 My friend told me it is the curse of the designer... next year the stores will be stocked with aqua & white and everyone will have a frosty Christmas! Here are the aqua ornaments all ready for the tree. Some are old ornaments that I have re-painted and some are newly handmade. Click on the photo above to read the notes. I made the paper houses last year. I printed out Christmas carols on my printer and glued them to card stock. The roofs were red last year but I re-painted them aqua. I also added the sashing to the windows and a hole in the back to insert a little christmas light so that it looks like there is someone home! 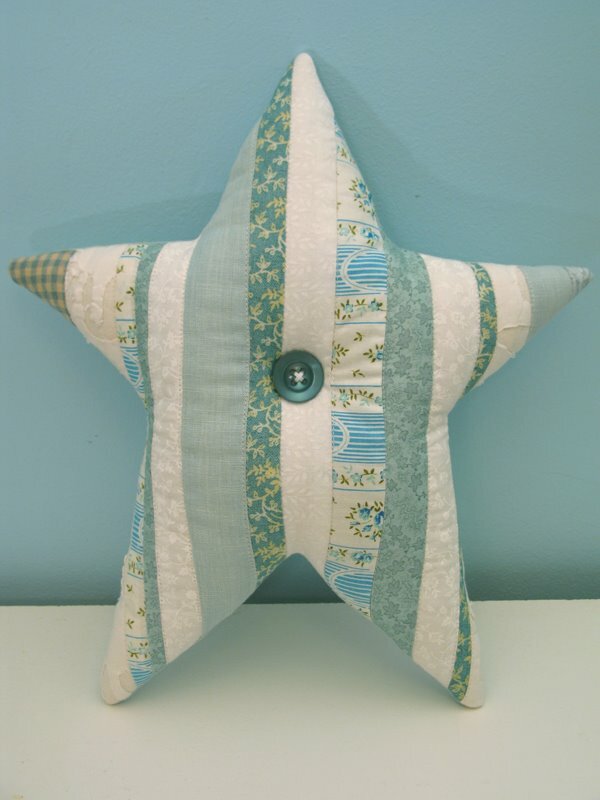 I also made a quilted patchwork version of my tree-topper stars which I adore, and a fabric Candy Garland all in aqua and white! We had a great time on Sunday choosing our tree from a friend's tree farm! 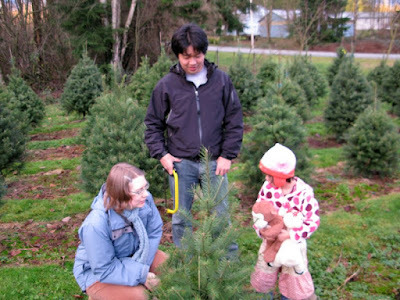 It was the first time that my husband has ever cut his own tree so it was a real treat. With the tree cutting & all the Christmas baking I've done, it has really put us into the Christmas spirit! Last night we decorated it all in aqua & white and I must say that it looks stunning... my husband was impressed too! And Claire loves all the glitter! My favourite part is the lit up houses but I also love the crocheted snowflakes that I bought from The Looks on Etsy! A very Merry Christmas to all my crafty friends all over the world! your Christmas tree is one of the cutest I´ve ever seen. And the ornaments you´ve made are just adorable. What a fantastic idea!! I wish you a nice day and a wonderful Christmas time!!! I love your aqua ornaments. I have been loving the aqua and pink colors for Christmas for a few years now, but didn't think anyone else was into it. Glad to see it catching on! Hi Laurraine, as always your ornaments looks very cute. I wish a very merrs Christmas and thanks for all the inspiration you gift to me. Beautiful, festive and original! 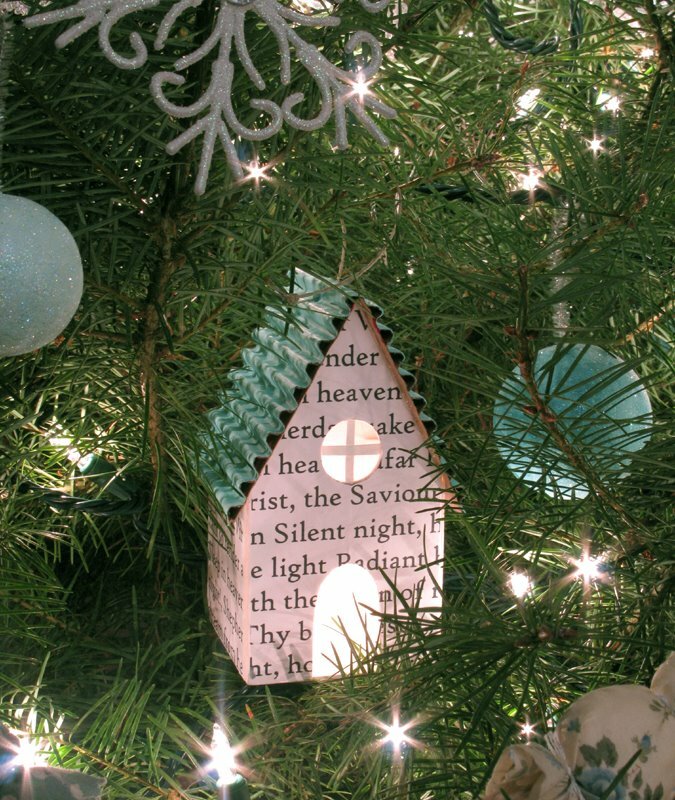 Great ideas for those ornaments. It is always a treat to see what you come up with next. Thanks for sharing, and happy holidays. Thank you for sharing your Christmas spirit. 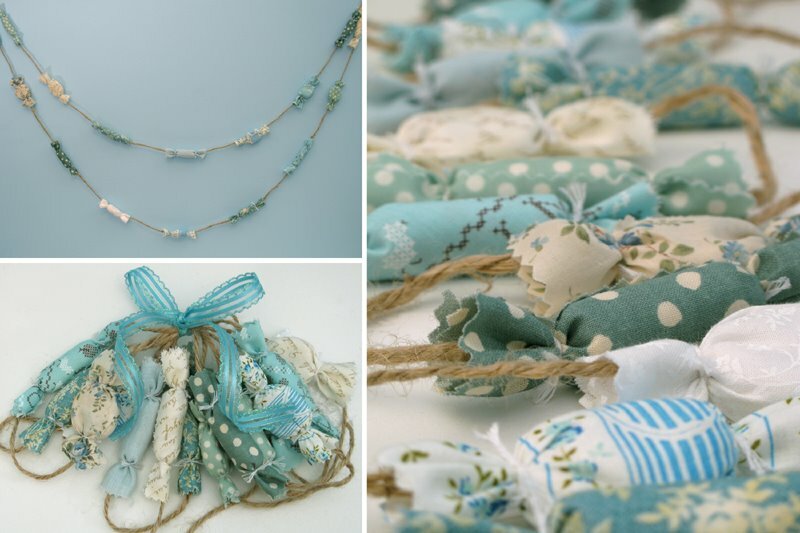 I love your Aqua and white Christmas. And I'm in love with your small tree! It's adorable! Great ideas! I love dropping by your blog...it always makes me smile. Laurraine, this is beautiful!!! I love the houses! Merry Christmas to you! 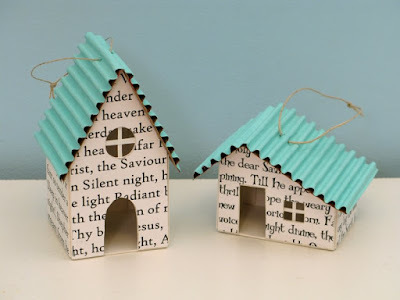 Ohhh, I love those little houses! However did you make them? Is there a template somewhere, I can view? They are beautiful! So adorable! I just love the little houses. 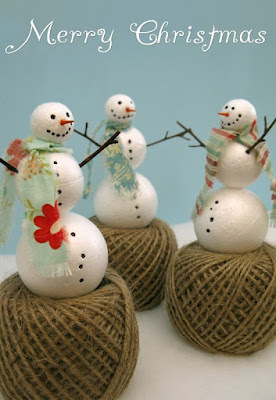 And thanks for saying how you made those cute snowmen - my decorations need some cuteness this year! I AM IN LOVE!!!!! Adorable work. The aqua and white theme is such a success! Thank you for sharing. I'm going to keep an eye out for your books and patterns. They may make it down to Oz sometime! Or perhaps from you...? Yours is a beautiful blog, excuse me but I don't speak English! 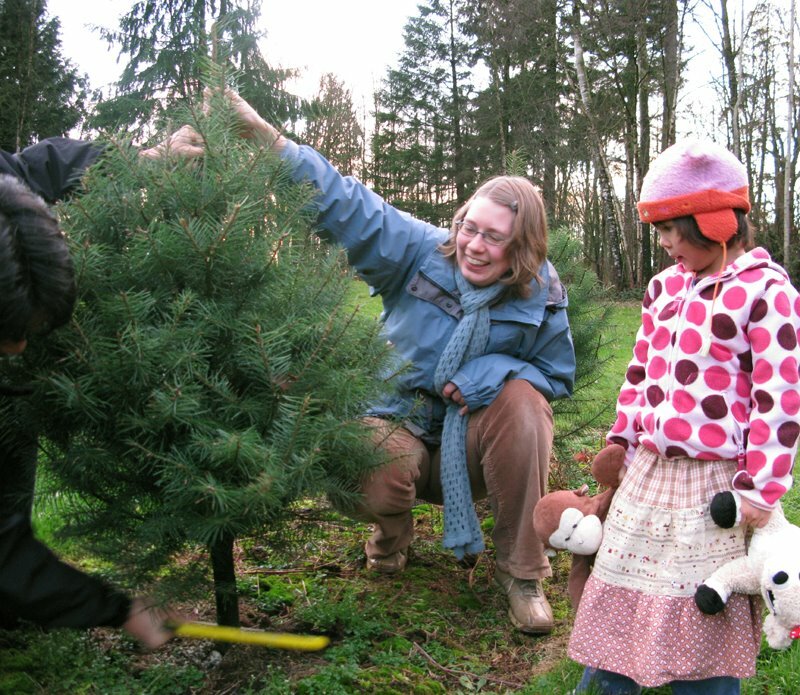 Oh, you have a wonderful christmas tree! You are inspiration incarnate. I always feel happy whenever I get the chance to visit! olá,visitando seu blog...lindos feitos!! !te add em meu blog ok! I am lovin' your aqua Christmas! Your aqua decorations are very pretty and the tree turned out lovely. The card is darling and Merry Christmas to you and your family. 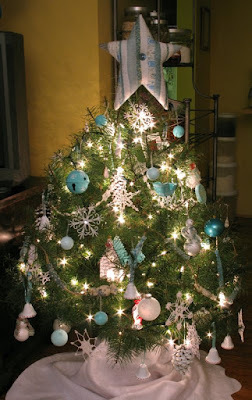 Perfect little tree and I love the aqua ornaments. Thank you for sharing. Oh, absolutely beautiful! I just love the color scheme. Happy Holidays! Laurraine, your ornaments look stunning! I wish you and your family a very Merry Christmas and a wonderful New Year! Such a beautiful Christmas tree. Merry Christmas! cool!!! in my country we do not pick our Christmas trees, buy artificial versions in stores. I loved your pictures, your family is beautiful. congratulations!!! you must have mercy on me... I think you have reduced my life to watching your flickr account... and pinning it!